Robins are one of those taxonomically confusing terms, like bunting or grosbeak or warbler, that are applied to groups of birds in different, often disparate, families. In the New World, the birds we call “robins” are deep-bellied, melodious-voiced, thrushes of the genus Turdus. In the Old World, they’re little, roundish, chats (another of those odd terms). 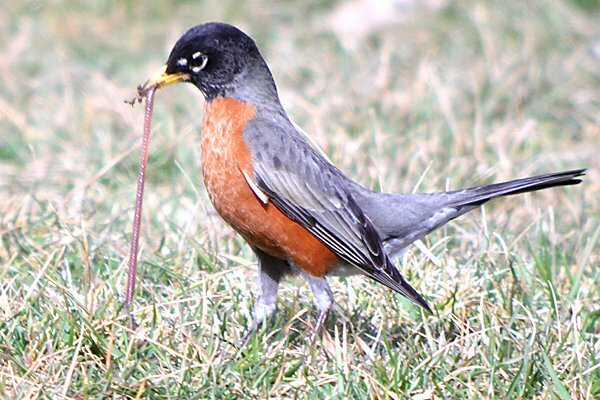 The only real point of intersection between the two families is in the red-breasted plumage of the two most famous members of their respective clan, American Robin and European Robin, and the fact that both have become a symbol of spring’s return to the Northern hemisphere. So we’re trying something a bit different this time. When I say “robin”, I’m referring to both kinds of robins, those of the genus Turdus in the family Turdidae, and those chats of the family Muscicapidae also called robins. I suppose we’re going with a semantic group rather than a taxonomic one this time. It’ll be fun. So send me your robin photos and posts! Get them to naswick AT gmail.com by April 9 for an IATB published on April 11. Be sure to put “IATB” in the subject line! Are petroicid robins from Australasia also welcome? Sure, David, why not? The more robins the merrier! I and the Bird: What is a Booby? Call for I and the Bird: Show me your Sulids! I and the Bird: What is a Swallow? Do Common Gallinules Get Jealous of Purple Gallinules?